One of the most popular dances, a classic you are likely to meet at every festival. It has a gallop, a strip the willow and a sort of shunting back and forth to get from one end of the set to the other. Longways sets of four couples... So you need a partner⬀ and you join up with 3 other couples. Men on one side, ladies on the other. It's good to make sure that you know where your set 'starts' and 'stops' (and, once you've got four couples, make sure any further couples don't attach themselves to 'your' set). It can be a measured lead down or a mad gallop (way past the end of the set and then back up into place), you just have to be at the bottom of the set 'poised' ready for a Strip the Willow. As the result of a strange construct of geometry, the men will find they have more time when Stripping the Willow in the Foula Reel than in, say, Stoke Golding . This is because the working couple⬀ are stripping up⬀ the set. Right arm to your partner, Left up along the line. There's an easy way and a difficult way of doing this. The difficult way is swing your partner when you get back to the top, untangle yourselves, make an arch and get the lady to the outside of the set, facing down to look over the heads of the line of men. The easy way is that the lady carries on with her left arm turn with the last man, that is keep that last turn of the Strip the Willow going, until she is facing down the outside of the set and launches herself down behind the line of men. Her partner just has to stay out the way, make it clear and obvious that the lady needs to make the most of the left hand turn and join in with the arch when she's heading down the set. Two steps and reverse direction. The first man takes a step sides ways down the set and pulls his partner. If all is working well, he'll reverse into a gap .. The top couple do have to make sure they have got to the bottom and out the way by the end of the music. If they are not careful, the new top couple will run into them as they gallop down. A Shetlands dance, supposedly from the Swedish Väva Vadmal, or the 'Norwegian Country Dance' (The fiddler's companion, quoting Traditional Dancing in Scotland , Flett and Flett, 1964). The version typically danced in English Ceilidhs is fairly standardised, although there are a number of similar dances based round a Strip the Willow (such as the Stoke Golding Country Dance ). for Michael Powell's 1936 film, The Edge of the World . It may look a bit different north of the border. 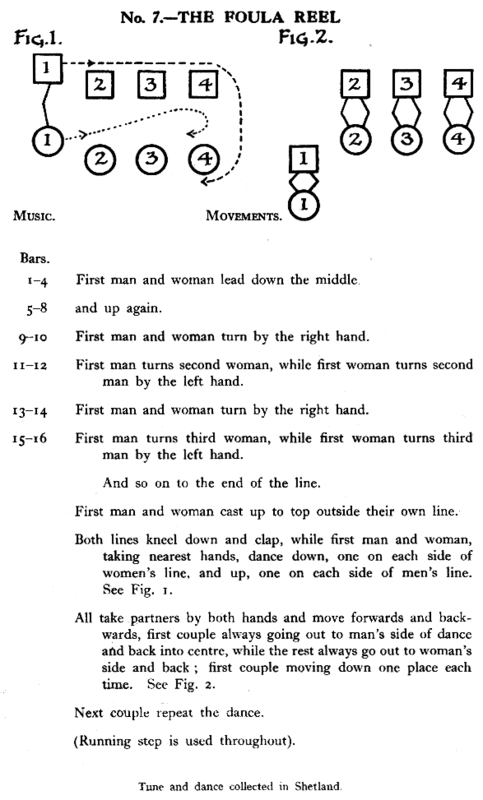 The Scottish Country Dance Book, Book 4, 1927 (see the Strathspey description) has the first couple dance down and back and Strip the Willow from the top. Poussettes can be messy; people forget whether they should be pushing or pulling, people crash into each other, they can get out of time with the music and the first couple has cut and run for the bottom to get out the way. If you are going to pull, hold your hands to beckon your partner to follow you. You don't have to step together to join hands only then to step back. Hold back and let your partner come to you. If you are going to push, come into the move with your hands showing that you would like to push.